Stock photo of Creek in Monashee Provincial Park, Okanagan, British Columbia, Canada. Flowing creek in Monashee Provincial Park, Okanagan, British Columbia, Canada. 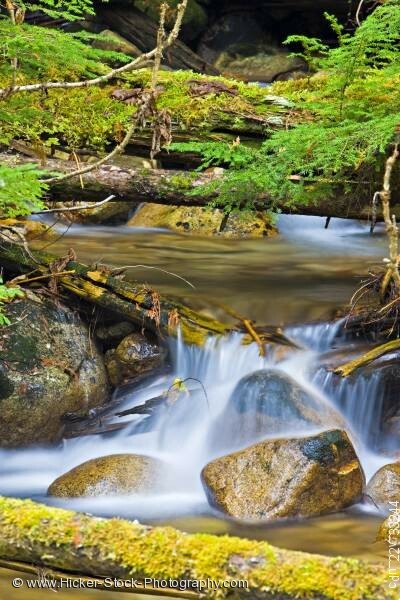 This stock photo shows a rapidly flowing creek in Monashee Provincial Park, Okanagan, British Columbia, Canada. A beautiful autumn day reveals the misty water flowing over fallen tree branches and large rocks in the Monashee Provincial Park. The water flows downstream over tiers of rocks and branches in a heavy milky mist. Branches from nearby trees hang low over the waters of the rushing creek. The lush foliage shows colors of gold and green of the heavily hanging branches. In the foreground, a fallen branch lays over the water with thick golden moss growing on the upper side of its trunk. The beautiful Monashee Provincial Park is located between Arrow Lakes and Shuswap River with a view of the Monashee Mountains in British Columbia, Canada. Creek in Monashee Provincial Park, Okanagan, British Columbia, Canada.